Welcome to our hop! If you just came from Amy's blog, you are on the right track. We have a GRAND PRIZE for this Blog Hop donated by ContainYa Crafts! You can have YOUR CHOICE of a Scrap'n Tote or a Scrap'n Easel! Each blog in this two-day hop has a special letter and when all of the letters are put together they spell out a secret phrase. 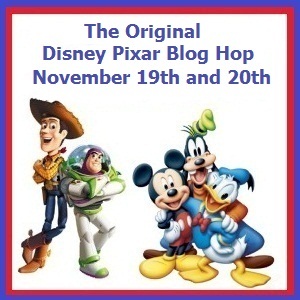 Once you have stopped at each blog in the hop and collected all of the letters, simply email the phrase they create to bloghopcontests@gmail.com. All entries must be in by midnight on Monday, November 21st. The winner will be announced on Tuesday, November 22nd at http://craftychicsblog.blogspot.com. But...that's not the only prize you can win on today's hop. Don't forget to check out the bottom of this post for your chance to win some more great blog candy. Just like all of my Cozies, this one has a little love sewn into it. And who can forget that huggable Pooh? Here he is chillin' with Piglet. Here's another shot of this cute fabric. Have you guessed what it is yet? Maybe this will help. The hand-crocheted flower on the front matches Pooh perfectly! The background of this fabric is a light blue cloud that contrasts nicely with the brightly-colored characters. The purple stripe and ends coordinate perfectly. Wouldn't this brighten up any craft room? You can win this Expression Cozy (or an Expression 2 or Baby Bug Cozy--your choice) if you leave a comment on this post. A lucky winner will be picked on Monday, November 21st and will be notified by email. If you would like a chance to win, just leave a comment, along with your email address. For an extra chance to win, you can also leave a comment on my facebook page (Kathy's Cozies). Be sure to check out my Etsy, shop, too! Just in case you missed any of today's stops, here's the entire list. Happy Hopping! EEEEK! What a fun Cozy this is. I love the fabric choices. NICE JOB! O my goodness this is so cute!! i would love to win one of your cozies!! What a cute cozie! I love Winnie the Pooh and Eeyore! I love the little heart hidden in the stitching. I wonder if you could do a Hidden Mickey? Like the Disney Pooh & Tigger cover. I'm a new follower. I like Tigger best. Like all things Disney. I worked for the Mouse as in Disney World thru high school & college. Thanks for giveaway chance. Kathy this is too adorable, oh how I would love this on my Expression!! It even has Tigger, my fav. Love the cozy!! Tigger is my all time favorite next to Pooh and the rest of the gang. This lil cozy would be right at home in my scraproom fondly named after Tigger! I am definitely asking for this for Christmas. I love this :) Beautiful! Adorable Cozy, I love Pooh and that fabric is gorgeous! I'm really needing a Cozy for my E2, thanks for the opportunity to win, you are too kind and generous to offer one as blog candy! Kathy, adorable:) All of your Cozies are beautiful, but this one would look soooooooo cute in my craft room:) HAHAHA!! I think you did an amazing job. Your talent in endless. TFS! Happy to be on this hop with you. So happy you are a part of our hops! Love your Disney cozy!! Pooh is my favorite! Glad to be in this hop with you!! Lovely cozy. Oh I would love to win one lol. Thanks for the chance to win. Im already a follower. Aww, I didn't know you put a little heart on all your creations. What a sweet touch. I always enjoy seeing your cozies in these hops. You do such a fantastic job. Your work is amazing and your attention to detail is enviable! I love the little heart tucked in the middle. It gave me the smiles..
Love the Pooh cozy. Perfect colors. Your Pooh one is tooooo cute! LOVE IT!!!! This is so adorable. And being a huge Pooh fan it is just what I need for my scrap room. OMG, this is amazing... someone is going to be very very lucky!! Adorable cozie!! I just love Pooh!! Thanks for the chance to win!! OMGosh that is awesome. I love Pooh and his gang. I thought that I had already posted here but never seen it in your comments! I would love to have one for my new E2!!! Wow ... what an adorable cozy!! Thanks for the chance to win. I NEED a Cozy...my scrap room is by the back door and there is always dust blowing in all over everything. Wow - just made a spot for my big cricut in my craft room - and this would brighten it up a lot! Need to check out your etsy store! Cute, cute, cute!! You are such a talented lady. I have followed you for awhile on my facebook. I love to see all your creations. Thanks for sharing in the hop! This is the cutest cozy ever and Pooh is my favorite!! This is just too cute. I would love to win one of your Winnie the Pooh Cozies. Thanks for the chance to win. I love that cozy and my Expression would love to be wrapped in it! Thanks for the chance to win! What an awesome cozy! I love that Silly Old Bear and his friends! That is the cutest I have seen!!!! That is the CUTEST Cricut Cover or Cozy ever!!! :) I love it and that heart on the end is such a special touch!!!!!! OMG! I just fell in love!!! What a beautiful cover with all my favorite Disney Pals! TFS and for the chance to win this stunning cover. Very cute cozy. It's very generous of you to give away one of your works of art. TFS and the chance to win. Tiggerific Job on the cozy Kathy!!! Already a follower and very Happy to be able to hop along on Day 1 of the 4th Hop. I will head over to FB to see if I am a fan there yet! what a wonderful cozie! i love pooh and tigger! TFS and the chance at a terrific blog candy!!! OH MY GOODNESS. I would love to win this cause Pooh is my all time favorite Disney charter not to mention purple. You are so talented. TFS and a chance to win this. That Expression cozy is too cute! I sure hope I win! Thanks for the chance! Love the fabric! oh, my..what's a bear to do?